Anirudh Raithwan is a Sales Driven and Guest Service oriented Hospitality professional with 15 years of international experience. He has a Postgraduate Degree in Hotel and Tourism Management from France with more than 15 years of experience in various countries of Asia, Middle East & Europe. 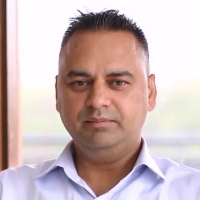 He has a specialization in pre-opening hotels and resorts as a General Manager in hotels such as Clarks Inn Lucknow, First Days Hotel (Wyndham Hotels Worldwide), Neemrana, Kanatal Resorts & Spa. He was also associated with the renowned international chains like Burj-al-Arab Jumeirah, Dubai, Oberoi Hotels & Resorts, Choice Group of Hotels & Jay Pee Group of Hotels. Hotel Management is a course which tells one about the basic operations of the hotel industry. During the course, one learns about different departments of the hotel, its functionalities, operations and career prospects. "I did my Hotel Management from IHM Bhubaneswar and then pursued my Executive MBA from Institute Vatel in France and Masters in Tourism Management from Perpignan University, France. And finally, I launched my own Brand in 2014 called Samaira Hospitality."